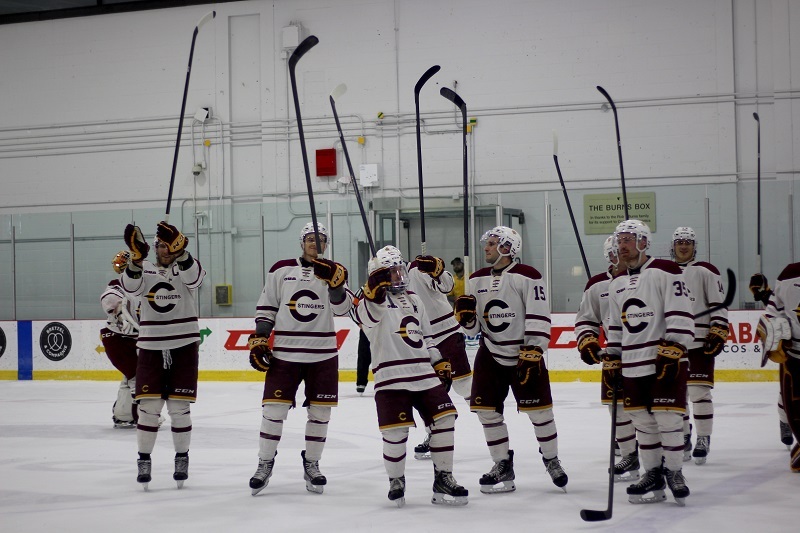 The Concordia Stingers men’s hockey team won their third-straight game Friday night. They defeated the Royal Military College (RMC) Paladins 4-3 at the Ed Meagher Arena. After a first period controlled by the visitors, the Stingers scored three unanswered goals in the last 40 minutes of play to defeat the Paladins. The Stingers finally broke the tie 41 seconds into the third period with a goal from forward Jean-Philippe Beaulieu. Head coach Marc-André Élément said the Stingers will need better starts if they want to win their upcoming games. After trailing 15 to 13 in shots after the first period, the Stingers came back strong and finished the game ahead 44-27 in that category. “I think the big difference between the first period and the rest of the game is that we won our battles [for the puck] and kept it simple in the defensive zone,” said Stingers defenceman Charlie Roy, who scored his first goal of the season in the first period. Defenceman Anthony Gingras, who scored the Stingers’s second goal, also got his first of the season. Élément said the team made adjustments and played more aggressive in the second and third periods. The Stingers received 25 penalty minutes, while the Paladins received 12. Stingers forward Francis Brunelle received a game misconduct penalty in the third period for a hit from behind. Goalie Marc-Antoine Turcotte made 24 saves in the victory. It’s his sixth win this season, and his third-straight after the team’s 8-1 loss against the Ottawa Gee-Gees on Nov. 17. The Stingers play their last game before the holiday break this Saturday night against the Nipissing University Lakers. The game will begin at 7:30 p.m. at the Ed Meagher Arena.